When it comes to your business, time is money. At Polar Heating and Air Conditioning we are available 24 hours a day, 7 days a week to handle any furnace repair, boiler repair, rooftop unit repair and more. Are you looking to replace the heating and cooling equipment at your business? If so, you will not find a lower price on the best equipment. We know you have many choices when it comes to commercial heating and cooling companies, but when it comes to value and quality – no one beats Polar! At Polar Heating and Air Conditioning we understand the needs of business owners and we work around any schedule to get your heating and cooling equipment working as soon as possible, You can trust our certified HVAC technicians to give you the service you need and to explain all service to be performed. We understand that when it comes to commercial heating and cooling companies in Chicago it’s hard to know who you can trust. That is why we offer A FREE second opinion on all commercial heating and cooling repairs. If you have already received an estimate from one of our competitors, we will come out and give you are diagnosis for free. Plus, we offer the most affordable pricing around, so you have nothing to lose. Contact us today to discover why so many Business Owners turn to Polar for all of their commercial HVAC repair needs. 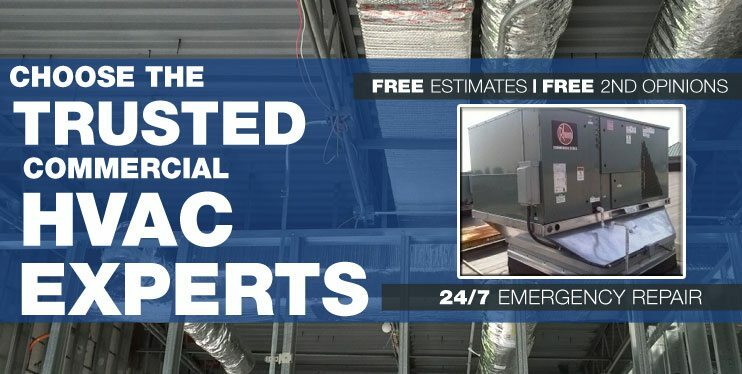 24/7 Support: We will repair your commercial heating & cooling systems 24 hours a day, 7 days a week. Prompt Service: Fully-stocked, dispatched service vehicles allow us to perform commercial heating & cooling system repair, maintenance, and installation quickly. Guaranteed Best Prices: We will beat any reasonable commercial heating & cooling system installation or air conditioner repair estimate from any legitimate air conditioning installer by up to 5% including Four Seasons Heating and Air Conditioning, All Temp, Home Depot, ARC, Service Experts, Chicago Heating Repair, Hoekstra, Sears Home Improvement, Artisan Heating, or Integrity Heating, call us…we’ll beat it!! Superior Customer Service: Our goal is your complete satisfaction with all aspects of your commercial heating & cooling system. New Commercial Heating & Cooling repair experts: With over 60 years of experience with all types of commercial heating & cooling systems, we’ve seen it all. We can repair or install any make and model of commercial heating & cooling system.